This thick, fragrant stew is thoroughly hearty and warming, and it requires little effort to make. Heat 2 tablespoons of the oil in a large non-stick pan and fry the meatballs to seal in the flavour. Cook in two batches for about 3-4 minutes each, until a deep golden brown all over. Remove from the pan with a slotted spoon and drain on kitchen paper. Add the onions to the pan with the remaining oil and fry over a high heat, stirring constantly, for 3-4 minutes until golden and soft. Stir in the cumin seeds and fry for a further minute. Add the tomatoes, rice and stock. Return all the meatballs to the pan and bring to the boil. Reduce the heat and leave to simmer gently for about 25 minutes, or until the rice is just cooked. Add the red pepper salsa and stir over the heat for 1-2 minutes without boiling, then stir in the coriander. Pour the stew into a wide-necked flask or takeaway foil containers to keep warm. Serve with soured cream and a big bag of tortilla chips to dunk in. 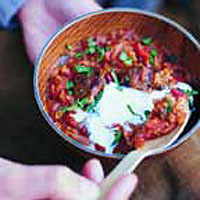 If you have growing teenagers or a family with larger appetites, use 2 packs of meatballs and cook in batches as above.